Looking for a versatile potato side dish? 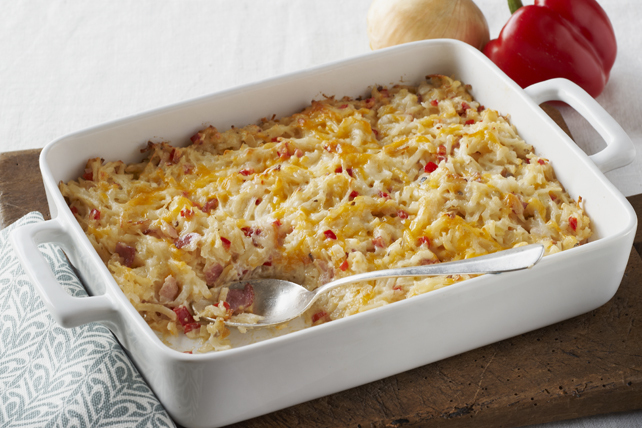 Breakfast, brunch or dinner, this cheesy, bacon-y hash brown casserole is a super side dish for any time of the day! Cook bacon, onions and peppers in large skillet on medium-high heat 5 min. or just until bacon is crisp, stirring occasionally. Transfer to large bowl. Add hash browns, soup, sour cream and 1 cup cheese; mix lightly. Spoon into 13x9-inch baking dish sprayed with cooking spray; top with remaining cheese. Crush 30 Ritz 30% Less Fat Crackers; place in medium bowl. Melt 2 Tbsp. non-hydrogenated margarine; mix with cracker crumbs. Sprinkle over casserole before baking. Feel good about serving this tasty casserole at your next gathering. As a bonus, the potatoes and peppers team up to provide a good source of vitamin C.